A Pashmina Cashmere & Silk Shawl with a hand beaded scallop edge featuring fresh water pearls and tonal white, crystal and silver beading. 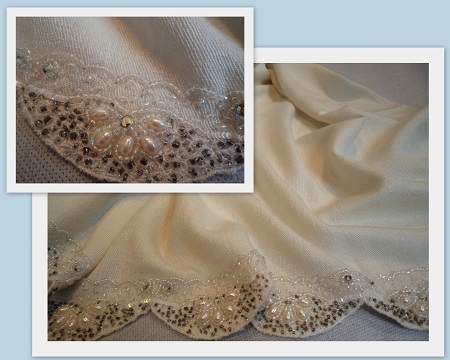 A truly beautiful and subtle shawl for that extra special occasion. Please note: our cashmere is not bleached white as this damages the delicate fibres. The colour achieved is a soft off-white. If you would like a colour sample to match to your gown before purchase please email pashmina@mayfair-valley.co.uk or telephone 020 89692341 during office hours.